More molehill collecting for me today. I’ve been busy repotting some balcony herbs and took the risk of sowing a few seeds. So more soil was needed! Some of the molehills in park Frankendael are very sandy, others are full of organic matter. 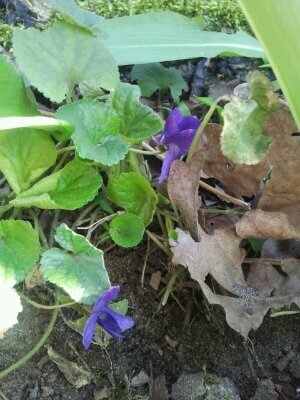 Here’s a sandy one – just right to add drainage to the organic soil I bought from Albert Heijn. 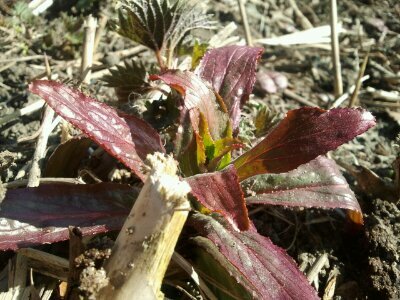 The little Plantain (Plantago major or media) in the photo was completely covered by the hill until I scraped the top soil away. Just that one molehill filled an empty 5 litre soil bag. 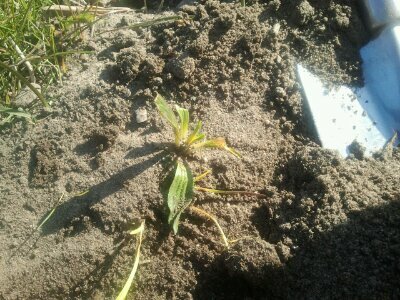 Plantago media is an endangered species in the Netherlands, so if that’s the plant I’m extra happy. Either way, my molehill antics provided free soil for me and a freed herb for the park! 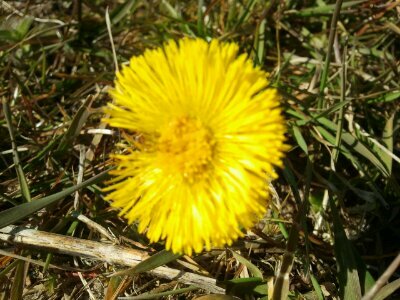 I’ve found lots of Coltsfoot (Tussilago farfara) today, both in the park and other parts of town. I’ve been collecting some of the flower heads to make Coltsfoot honey. They smell amazing when just picked and it’s easy to see why they are a great cough remedy. They are easiest to find in grassland close to water. They look like Dandelion from a distance. But close-up they look like strange Asparagus type scaly things, shooting up as spears through the soil and sending flowers to face the sun before producing proper leaves. Very difficult to mix them up with anything else. More Motherwort (Leonurus cardiaca) NL:Hartgespan. 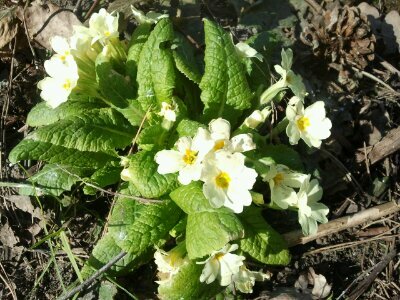 If in doubt of this plant (but certain it’s a square stemmed Labiate) nibble a tiny bit of leaf. If the extreme bitterness literally knocks your socks off, it’s Motherwort! 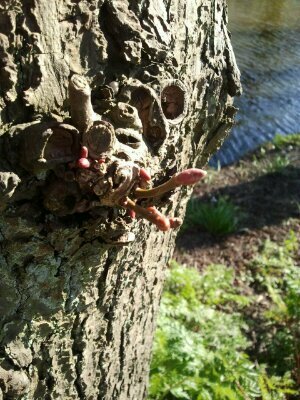 Lime tree buds (Tilia sp). Reach for a too high for dogs twig, maybe on a burr such as this. Snap off a fresh tip bud (after checking its OK with the tree of course) and just pop it in your mouth. After a little chewing your mouth will be full of unmistakable Lime tree goo! It’s great stuff for all manner of ailments and makes me feel very happy to know the tree, every time to do it. I can’t really understand why everyone else in the park doesn’t do this. There is some information I wrote a while ago about Lime, for those wondering what all the fuss is about. 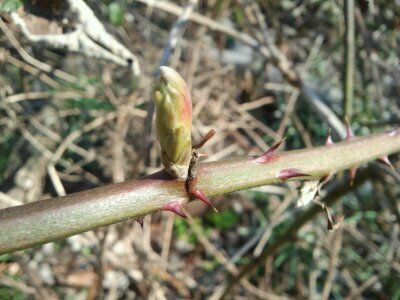 Bramble (Blackberry bush) – just the soft green shoots. 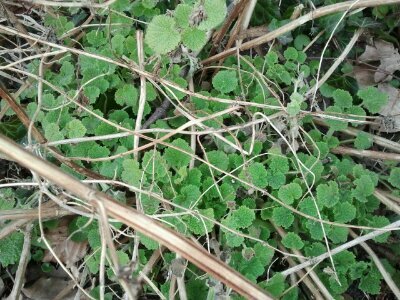 Added to my Spring brew (and still really tastes great hours later as I write this and enjoy the second pot) was of course a leaf or two of my new herb friend Common Horehound (Marrubium vulgare). 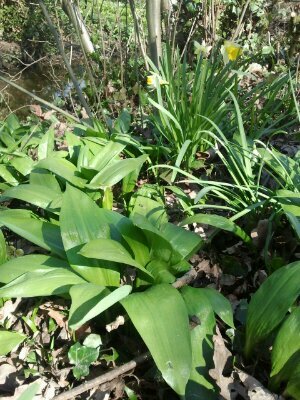 Wild Garlic (Allium ursinum) remains in pungent foliage. And finally today, a real taste of the foraging weeks to come – Ground Elder (Aegopodium podograria). Just a few plants coming through today but it’s up! I absolutely love this herb (though it’s often a real pain to gardeners). 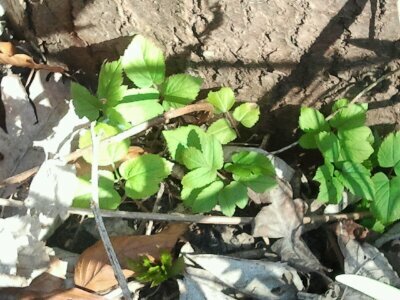 It’s common English name is Goutweed because it helps clear the body of uric acid amongst other things. I love it because it makes me feel good and tastes rather like Parsley. 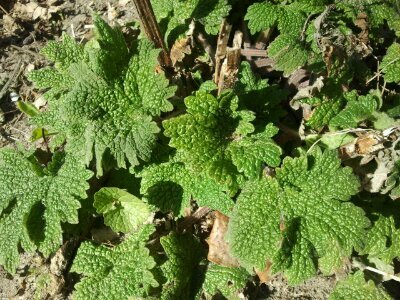 It can be eaten, used medicinally internally and applied externally in things such as salves and compresses. Learn more about it at the June Embrace Your Weeds workshop which I’m running with City Plot.